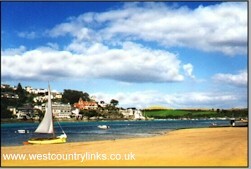 Salcombe Hotels Cottages Caravan Parks Campsites Devon. A popular sailing centre, it is said to have the mildest climate in Devon, orange and lemon trees grow in the gardens here. Salcombe was a busy port in the 19th century, used particularly by schooners bringing fruit from Spain and Portugal. Bathing is safe from the golden beaches and the local restaurants are all recommended. Overbecks Museum & Garden - National Trust. Collection of curios in Edwardian house with sub-tropical gardens and views over the Salcombe Estuary. Disabled access - wheelchair available. Refreshments.